Alan Rickman turns 69 this year so we thought it would be a perfect time to look back at the iconic roles he’s played throughout his successful career. Of course, some are more magical and out of this world than others, but there’s no doubt that they’ve all been responsible for making us fall in love with this talented actor. Of course, Rickman’s portrayal of Professor Snape in the eight Harry Potter movies has to be #1. His performance moved viewers to both hate and love Snape, and his close involvement to the character’s costuming and early knowledge of Snape’s fate secures this role in the top spot. 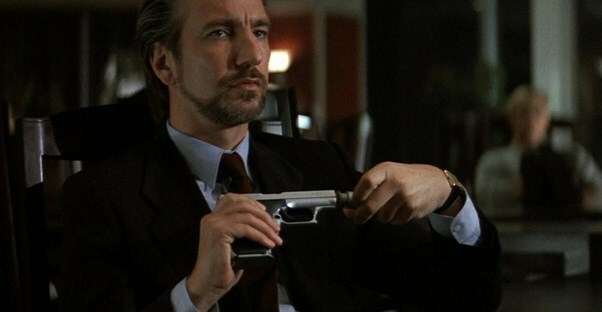 Hans Gruber is the villain of all villains. Hostages? They mean nothing to him. Intelligence? Unmatched. He correctly anticipated the FBI’s moves. He figured out who McClane’s wife was. He even personally took out the company CEO. Mix it all together with a small dose of cold humor, and you can understand why Rickman hit it out of the park with this role. To be fair, Harry is a jerk. But Rickman is just so good at playing the jerk role! The real problem here is that there is no plausible way anyone would cheat on Emma Thompson (Rickman’s wife in the film). So it’s no surprise that Harry realizes he was a fool and asks for forgiveness. She calls him out, and he admits to it. That means he can’t be that bad, right? The 1995 adaptation of Sense and Sensibility did several things right. One of which was casting Rickman as Colonel Brandon alongside Kate Winslet’s Marianne. It’s one of Rickman’s rare light roles and he does it well. It might have just been a voice role, but Rickman’s vocals killed it as everyone’s favorite hookah-smoking, blue caterpillar. With a voice like that it’s hard to be bad. Who better to play Ronald Reagan than stately Alan Rickman? Even though he’s not a red-blooded American, we can look the other way. But then we have to look back, just to make sure that it’s not The Gipper himself. While the film might not portray Reagan in an overtly positive light, Rickman adds some gravitas to an otherwise cartoonish array of presidential impersonations. While it was a supporting role in the movie, Rickman manages to make it meaningful and memorable. Judge Turpin isn’t exactly lovable, and Rickman might not have the voice of an opera sensation, but he’s better than most. Rickman perfectly voiced the chronically depressed Marvin the Paranoid Android in this comedic sci-fi film. This little robot had such a vast computational intellect that everything humans asked of him was hardly a challenge. Rickman mellowed out his voice into a monotone, creating the perfect non-caring foil to the very emotional humans aboard his spaceship.